This striking and high-end hotel seems contemporary but it has a long history which is camouflaged by its light, modern and immaculate presentation. But part of this building has been around for more than a couple of hundred years. Originally known as Felin Wynt, Welsh for windmill, the still-remaining and iconic tower was built in 1806. Yes, a fine hotel and one with a fascinating restaurant. It’s called Blas which means ‘taste’ in Welsh. The untutored might be expecting an over-themed rustic eatery with accent of sheep and nuggets of coal and the like. Well, my dear blinkered reader, Wales has an amazing culinary bounty, heaps of style, and piles of aesthetic good taste, and here it is at Twr y Felin Hotel. Blas is a beauty. The walls are hung with artistic gems which are Pure Evil – that is to say, they are masterpieces by the artist called Pure Evil. Charles Uzzell-Edwards is a celebrated graffiti artist and gallery owner who has the pen-name (or should it be brush-name?) Pure Evil. Perhaps you don’t know the name but his work is instantly recognisable and unique. His canvasses can be seen on the walls of Blas but also around the hotel. The restaurant, along with the hotel, is relatively new but it has already achieved two AA Rosettes and they are well deserved. The menu reflects the location: it’s not far from the sea and there are farms all around. The staff here know the producers and that relationship must help with quality, continuity and seasonality. This area offers Welsh lamb, longhorn beef, ducks, fish and seafood as well as fruit and vegetables. Don’t miss laver bread which is seaweed and versatile. OK, granted, the wines might not be local but they come from Berry Bros. & Rudd, who are trusted wine suppliers in London. Blas is open to both residents and non-residents for breakfast, lunch, afternoon tea and dinner as well as drinks. This is a lovely hotel in which to stay (review to follow) but also a delightful place to meet friends for outstanding food with complementing wines. 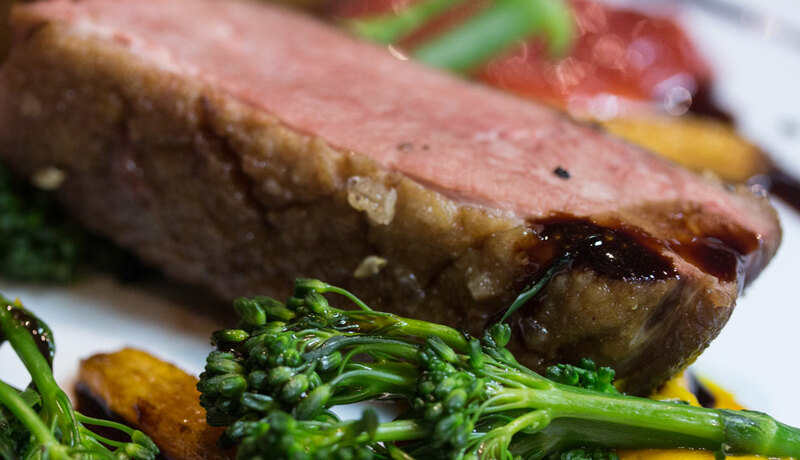 Dishes at Blas use Welsh produce but they are as sophisticated as dishes found in the best restaurants anywhere in Europe, and beautifully presented. 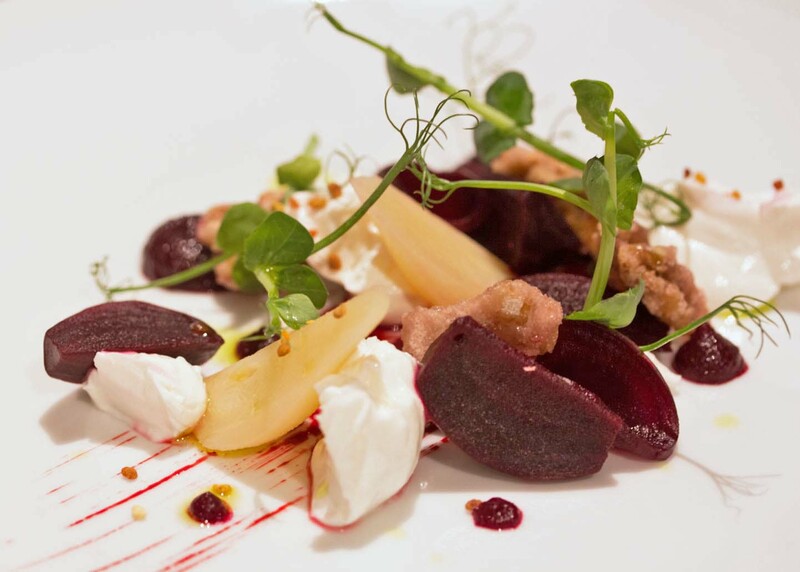 My guest ordered Goats Cheese with Beetroot, Pear and Walnuts. This was well-balanced in both texture and taste. Sharp cheese enhanced by sweetness from both fruit and beets. My choice was Braised Pork Belly, Apple, Black Pudding and Mustard. This was a melting triumph and not to be missed when it’s on the bill of fare. It was hearty and appropriately fatty in the best way. I was tempted to ask for a second portion as a main course. But along came the chef’s amuse bouche which was a whimsical interpretation of Coronation Chicken. 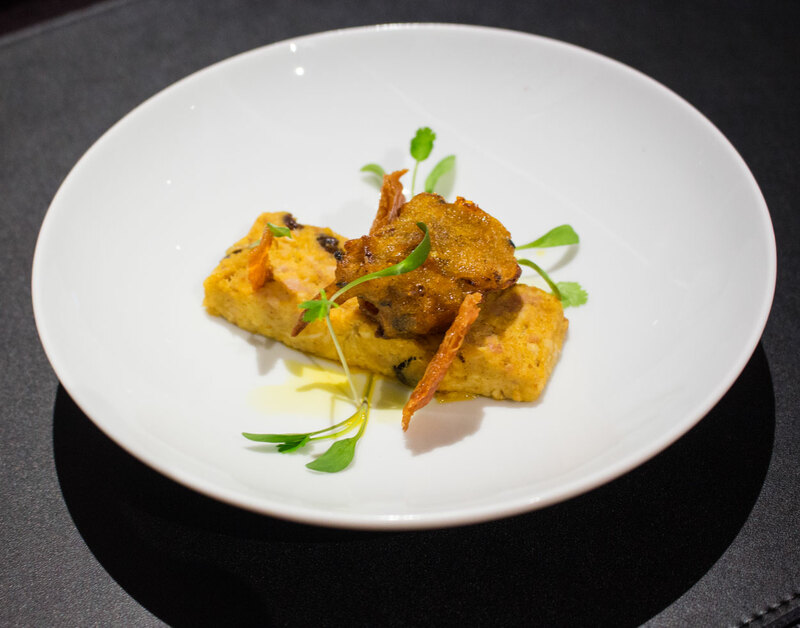 One might call it a ‘constructed’ Coronation Chicken, garnished with an onion bhaji and crispy chicken skin. This small bowl gave a nod to the reason why those rosettes were forthcoming. Barbary Duck Breast with a seasoned Duck Croquette was my companion’s main course and by this time he was expecting something a little different. 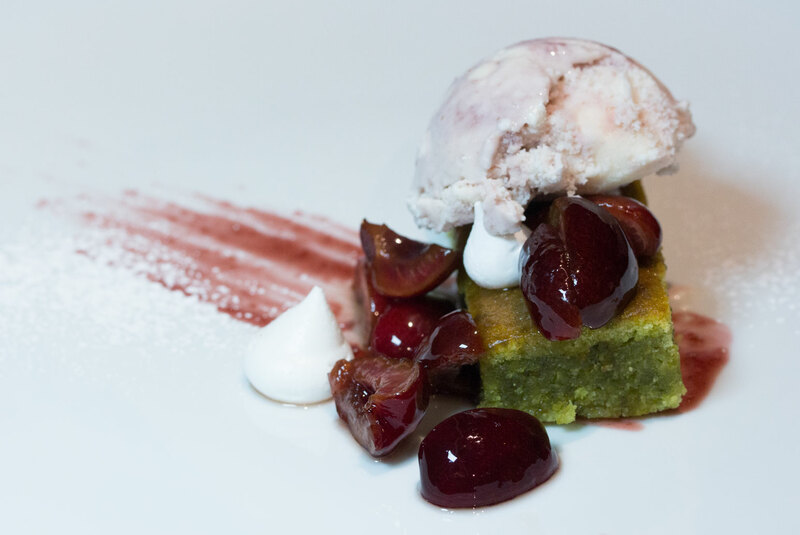 He got it in delicious fashion with a dish that showed complexity and respect for the basic ingredients, and was well-crafted. My main course was Turbot. I am so often disappointed by fish but the rest of the meal was so impressive that I wanted to try that fish here. Solva is a coastal village famed for its seafood. It has a sheltered harbour and is part of the Pembrokeshire Coastal Path. Crab is landed here and it napped the linguini that coated the perfectly pan-fried white fish. 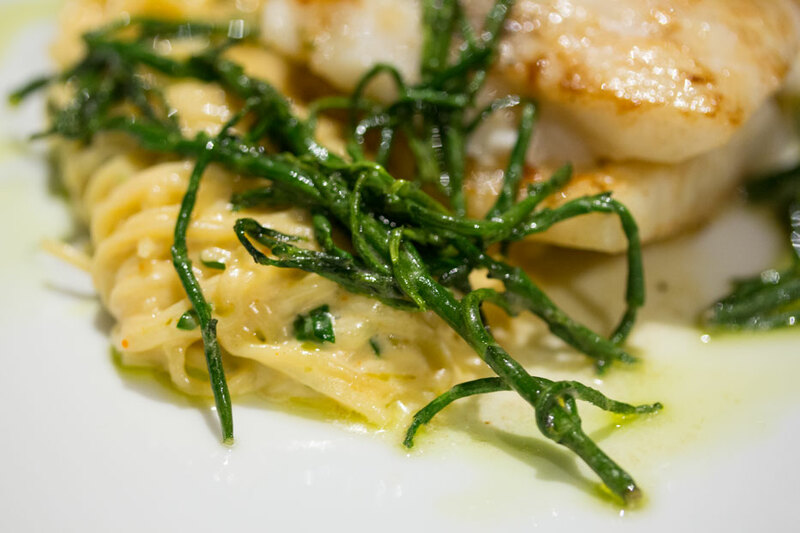 The delicate seafood was dressed with bright green samphire which has a slightly salty edge, and there was plenty of butter, which added to my joy. This should be a signature dish! I finished with a selection of Welsh cheeses – Perl Las and Perl Wen are cheeses which are impossible to find outside Wales. They are as good as any French cheeses; I believe the board changes with availability but there will always be blue, goats, soft and hard cheeses on offer. My guest opted for a slightly more exotic and a lot less local Pistachio and Olive Oil Cake which was flavourful, moist and green. But along with that there was Merlyn, which is indeed Welsh. It is (lowers voice to a whisper) a bit like Irish cream liqueur, but I honestly preferred this as it was much lighter and less cloying. Served over ice it made a perfect end to a perfect meal. Blas at Twr y Felin Hotel was outstanding. The food was as good as one would expect (or hope for) at an awarded restaurant. The staff were young but charming and well-informed. Blas deserves a visit a few times each year to see what’s new. The seasons change and so do the ingredients but it’s the skill and the imagination of the chef which will ensure continued success.